Part of the NHS's new 10-year plan is to make the organisation a testbed for new health tech, such as the portal-like HealthTechConnect. Dan Kendall interviews Lord Prior of Brampton on stage at the Startup Health Festival last week in San Francisco. Photo by Jonah Comstock. Lord Prior of Brampton, who took over last year as chair of NHS England, has big plans for the organisation he now helps lead — many of which were laid out in the 10-year plan announced last week. 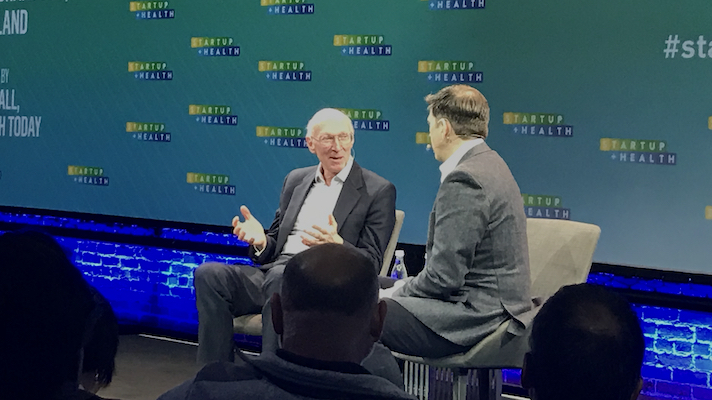 Lord Prior was also on hand at the JP Morgan Healthcare Conference in San Francisco, stopping by the StartUp Health Festival, where MobiHealthNews caught up with him. Broadly, the organisation is working to better integrate different kinds of care and to move its focus from treatment to prevention. Through its 100,000 Genomes Project, which met its eponymous milestone last month, he hopes to make the UK a world leader in personalised medicine. And finally, the NHS is increasingly focused on quickly and responsibly deploying digital health services. In a follow-up with MobiHealthNews, Lord Prior said that the particular challenge the NHS faces with regards to digital health technologies is not only to encourage a wide field of technologies in its testbed, but to ultimately incorporate the best ones as widely as possible, taking advantage of the national system. Lord Prior also defended the NHS’s rollout of Babylon’s GP at Hand app, which has received some measure of criticism for the speed and handling of its deployment. Lord Prior will serve a four-year term as chair of NHS England.